The unique legal status of marijuana has left it outside the normal consumer protection oversight of government agencies. Entrepreneurs are filling the void. Health concerns about pesticide and herbicide contamination of smoked marijuana go back a long time. The use of paraquat, banned from national forests in 1983 because of environmental concerns, was given the go-ahead to be sprayed for marijuana eradication on private property, but not on public lands, as early as 1988. The debate over herbicide and pesticide contamination of legal marijuana, however, began in 2012. During that year, the State of Colorado found that cannabis was being grown with pesticides, but could not receive guidance from the federal government due to marijuana's federal illegality. With growers voicing fierce opposition to any changes to the decontamination process for removing pesticide residues, the state gave inspections a low priority. The status quo has remained in Colorado ever since. Entrepreneurs have come to bear the brunt of that market, as some choose to invest into pesticide removal processes while others continue their manufacturing without incorporating a cleaning method. And they're up against big bucks with mainstream brands like Scotts Miracle Grow are predicted to be some of the >hottest cannabis stocks on the market. Some manufacturers have pivoted to become strictly "cleaning" services, wherein they wash other manufacturers' crude oil of pesticide and return it to them for further distillation and placement. While these entrepreneurs have had some success, a good amount of large manufacturers have still stuck to their guns producing a legacy product that may create issues down the line for consumers. As a result, retailers are now at risk of facing legal action, some even frivolously. LivWell Enlightened Health was subjected to a scientifically, factually and legally frivolous lawsuit in 2015 over its alleged use of Eagle 20. That case was promptly dismissed by the Denver District Court in early 2016. “The people behind this case do not want the commercial cannabis industry to succeed and will try anything to bring down the industry,” said John Lord, owner of LivWell Enlightened Health. Fast forward four years and the City of Seattle issues an advisory to alert consumers of the potential of risk of pesticide ingestion when inhaling cannabis. The city was unable to issue a more definitive statement or change in policy due to the lack of research on inhalation of pesticides. The State of Oregon recently counted 900 failures of pesticide removal from cannabis. In one instance, 370 batches of product were recalled from consumers due to excessive levels of pesticide. In this case, Oregon issued a letter reminding growers of the state's Pesticide Control Act and also promised to investigate growers who failed pesticide screenings. This is happening all across North America. Even though it's federally licensed, according to a NetworkNewsWire report Canadian cannabis company OrganiGram Holdings had "two Health Canada recalls of almost all its products sold in 2016 after residual levels of two banned pesticides, myclobutanil and bifenazate, were found and [the] company's organic certification was suspended until compliance to requirements was demonstrated." OrganiGram "took remedial measures to rectify the problems," but was left with a year's worth of lost revenues. Getting better, right? Not so fast. 2017 has been a tough year for California as the state gears up for recreational cannabis. 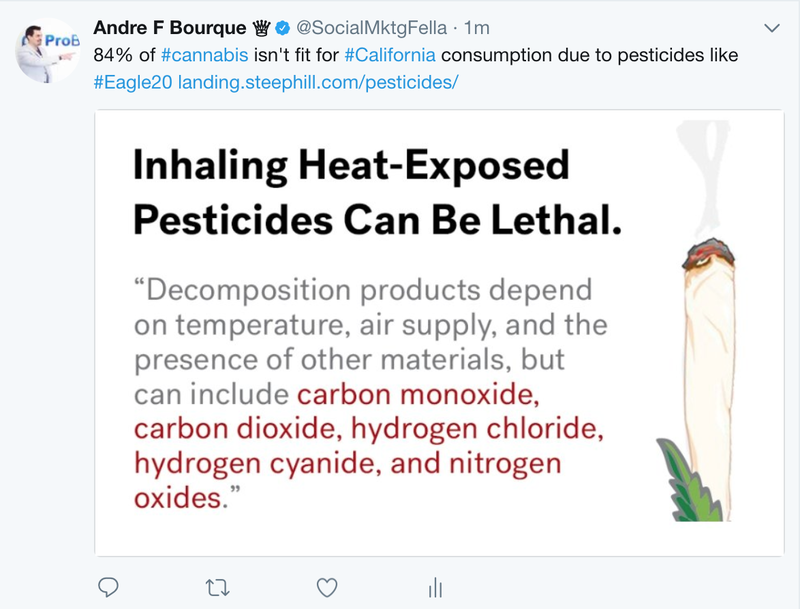 Steep Hill Labs, a premier lab testing facility in Berkeley, identified at least 84 percent of plants in a sample were contaminated with high levels of pesticide, including Eagle 20. Remember that name from earlier? Eagle 20 is the brand name of a chemical called Myclobutanil, which is produced by Dow Chemical. The problem with this becomes larger when thinking about the scale of the California cannabis industry. Most crops are derived from clones -- those clones have mother plants, and if those mother plants are pesticide-ridden, the effects are being multiplied by an exponential factor. Myclobutanil is used to kill pests and prevent mildew, but when combusted, it turns into hydrogen cyanide, which affects the brain and lungs and is lethal in high doses. While the U.S.DA tests edible plants for Myclobutanil, there is no such regulatory practice in California for cannabis until 2018. Let's break it down. Pesticides are prevalent in nearly everything, from food products to household cleaners. The EPA and U.S.DA have developed a framework for identifying and allowing certain pesticides in products, however, the base research does not include inhalation. This presents a unique window into the world of the consumer. Since most consumers are unaware of pesticides or choose to ignore their presence in cannabis, companies have had made short work of selling status-quo enabled products. Most manufacturers are focused on removing any plant material aside from THC and achieving the highest possible potency, and as a result, pesticides have flown under the radar. Consumers are generally happy with the end result, not taking into account pesticides. As recreational cannabis moves forward in 2018, the California Bureau of Cannabis Control has teamed with other organizations to clamp down on the use of pesticides and their proliferation in cannabis products. Now, consumers will be made aware of pesticides, any company who sells pesticide products will have their products recalled, and people will demand a pesticide-free product as the status quo. So, it's important that consumers begin to understand what is in their product and demand innovation now. "It's imperative that the standards for pesticide use in cannabis production follow the same critical regulations that are set for our food crops to ensure a safe product for the consumer and environment," I was told in an interview with Phil Guardia, CEO of Kelmar Cultivation Products. His flourishing 50-year old agriculture supply company is venturing into the cannabis space. So what's actually in the cannabis? The list is long and very hard to pronounce, but it goes something like this. Myclobutanil (Eagle 20., Spinosad, Piperonyl Butoxide, Spiromesifen, Bifenazate, Abamectin, Imidacloprid, Carbaryl, and Etoxazole. Take note of the second to last chemical, Carbaryl -- in a lab test, it was detected in cannabis at 415 parts per million, far higher than a much more common product, blueberries, whose tolerance is at a mere three PPM. That discrepancy highlights two problems. Inadvertent re-concentration of pesticide by cannabis manufacturers' into their end-product, which is then either packaged into raw material for edible companies or turned into high-THC concentrate. We know that in some cases, cannabis manufacturers are able to "wash" their flowers of pesticides during the extraction process, but we also know that a trace amount of pesticide can remain. This trace pesticide can re-concentrate itself during the following purification and distillation process if not "cleaned" correctly, creating another scenario where people are consuming high-PPM amounts of pesticide. Both possibilities are scary, in what we know and don't know. We know ingesting pesticides beyond the recommended PPM limit is dangerous, but we don't know what happens when pesticides are inhaled, and more experts are saying the latter is very concerning. Two things need to happen in the very near future. As cannabis becomes regulated in more states, governments need to develop regulations for growers and manufacturers, and consumers must demand a pesticide-free product. In the first scenario, while governments develop procedures to curtail and regulate the use of pesticides in cannabis, growers and manufacturers must also take steps to meet policy changes. While some growers are content with the status quo, options are available to shift best practices toward pesticide-free cultivation and pesticide removal in manufacturing. Using natural substances like neem oil and compost, in addition to good ventilation systems and dehumidifiers, can aid in growth of pesticide-free plants. As manufacturers also adapt to the system, they must either push their network to produce pesticide-free plants or create standard processes to remove pesticides to an appropriate, regulated level. "Cannabis is a technical crop that requires constant grower attention. Up-to-date knowledge of items such as irrigation, air flow, lighting and nutrients etc is critical to produce a safe and efficient crop," Guardia told me, explaining how manufacturers have no choice but to become compliant. "The old school way of growing will not work in order to legitimize the safety of the crop and the industry as we move forward." While innovations like flash chromatography and solvent chemicals have proven effective in cleaning up concentrated product, and some companies are experimenting with other during their process to produce a clean product for consumers, the entire industry must drive change. From edibles to flowers to dabs, every step of the supply chain should be educated and pushing for pesticide-free product in order to keep cannabis safe. Related: Survey: A Quarter of Cancer Patients Use Legal Medical Marijuana. How are cannabis entrepreneurs responding? Some small cannabis growers are fighting costly requirements and offering solutions. "We are rural and agricultural," one West Massachusetts farmer told his local legislators. "In Western Massachusetts, we voted at a higher percentage to allow this new industry and provide new economic development opportunities for ourselves and our children," Nicholas Robinson said. These opportunities need to have low capital requirements for small business entrepreneurs to obtain the necessary licenses and meet the proper standards. Non-organic pesticides can be effective that way. "There should be more cultivation and more manufacturing west of Worcester and on the Cape. We should allow non-brick and mortar entities and delivery services," Robinson envisioned. Some manufacturers are simply innovating better and more effective ways to create the purest of products. Started in March of this year, premier cannabis oil producer Medusa Labs is removing additives such as PG and PEG from their flavors in a series of changes aimed at promoting a purer product. 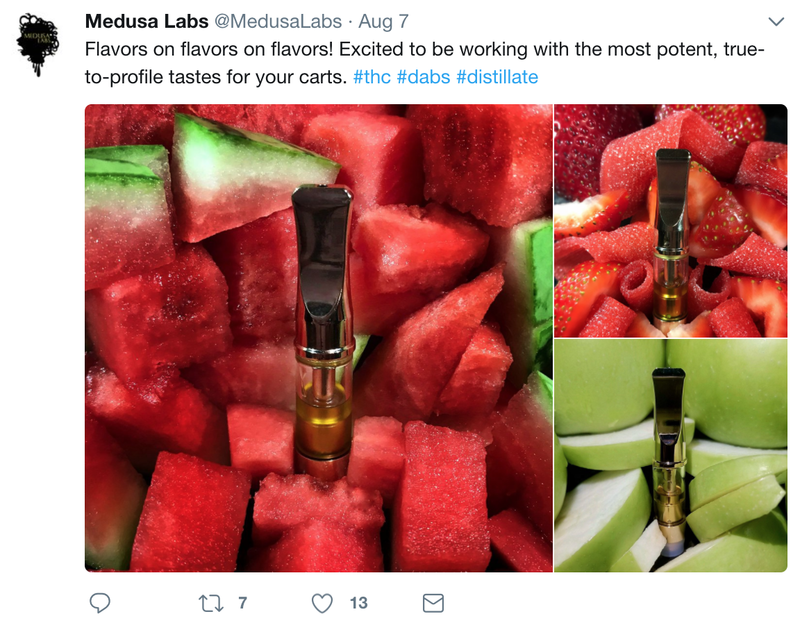 "We source pesticide-free crude oil and are promoting practices to reduce pesticides to minimal levels in our high-potency THC distillate," Sean Gee, CEO of Medusa Labs explained to me at a recent cannabis meetup. "During our uniquely proprietary distillation process, we carefully check temperatures and add organic compounds to ensure we end up with the highest grade product devoid of substances like chlorophyll, azulene, and residual solvents," Gee continued. "At certain points, these can turn into distasteful flavonoids and harmful carcinogens, and result in a lower potency." Still, some big brands are still selling vape pens with pesticides and/or additives with or without knowledge or proper testing. Other pesticide-regulation recalcitrant or otherwise simply unfortunate cannabis producers are likely to face warnings, recalls, or even bad mojo in what's a tight cannabis industry fellowship. This inconsistency creates broad opportunities for the kosher cannabis entrepreneur to introduce new sets of ideas with a focus on greater and greater product innovation. "I have been a retailer to the cannabis industry in Colorado since 2009," Joe Barnes, president of GrowLife Hydroponics Inc., told me in a written interview. "The requests we have received for products proven to cause damage have always troubled me -- especially for medical patients whose immune systems may already be compromised." In reality illegal operations have only one reason to grow -- to make money, and Barnes believes without these new, emerging we would see an epidemic of throat and lung issues on a large scale over the coming years. Third-party testing will be a major part of the industry moving forward on the right foot. Proprietors of independent third-party certification labs have an opening in legal cannabis -- another example of legalizing marijuana creatine unexpected business opportunities. As the cannabis market grows and along with it brings tighter standards and enforcement for testing, there's no doubt that there'll be more need for testing services. Not to mention the anticipated transition of labs that are now servicing traditional agriculture cross into cannabis as the market opens. Josh Wurzer, president of SC Labs remarked, "I was leery about working for a medical marijuana lab, but now I think it's a great career choice for people coming out of school with technical degrees because it supports a product that's behind the fastest-growing industry in America."